to benefit the Connecticut Humane Society’s Pet Food Pantry. For the second year, iGRAFIX will be collecting all kinds of unopened and unexpired pet food for the Connecticut Humane Society’s Pet Food Pantry at two drop-off locations in Collinsville, CT and Manchester, CT. Please click here for drop-off locations. Economic pressures force many families to give up their pets and release them to shelters in the hope that the animals will find a new home, will be loved and cared for. Many Americans believe that surrendered pets will be adopted or reclaimed by their owners once their situation has improved. The harsh fact is, for millions of animals that go to shelters, it is their last stop. About 4 million pets are put to sleep each year in US shelters, that’s more than 9,000 pets per day. The Connecticut Humane Society established the Pet Food Pantry in November 2010, to help pet owners that find themselves in tough economic situations to keep their furry companions. 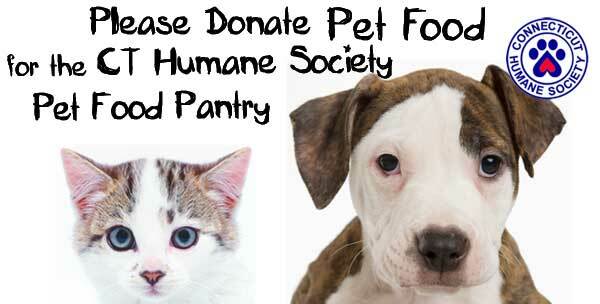 The pantry currently supplies food for hundreds of dogs and cats each month. Please help make life a little easier for our friends and neighbors in need. Your generosity will help families keep their pets at home and is truly appreciated! Food for small and furries…rabbits, Guinea pigs, etc. 30 lbs of food will feed one dog or three cats for one month. Last year, through the wonderful response from our supporters, we were able to deliver over 300 lbs of dog and cat food to the Pet Food Pantry (see pictures). We’d like to set the same goal for this year, or even a little bit higher, so that we can help at least 10 dogs or 30 cats. Drop off items at TGM Copiers, 717 Parker Street, Manchester, CT 06042. You can make a difference in the lives of people and their pets in your community!